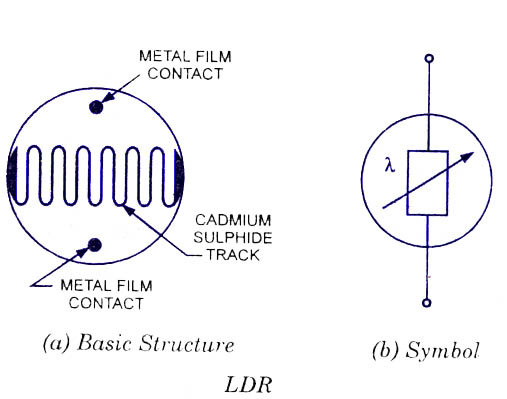 A Light Dependent Resistor (LDR) is also called a photoresistor or a cadmium sulfide (CdS) cell. It is also called a photoconductor. It is basically a photocell that works on the principle of photoconductivity. The passive component is basically a resistor whose resistance value decreases when the intensity of light decreases. This optoelectronic device is mostly used in light varying sensor circuit, and light and dark activated switching circuits. Some of its applications include camera light meters, street lights, clock radios, light beam alarms, reflective smoke alarms, and outdoor clocks. Some projects with the application of LDR is listed below. The basic structure of an LDR is shown below. The snake like track shown below is the Cadmium Sulphide (CdS) film which also passes through the sides. On theÂ top and bottom are metal films which are connected to the terminal leads. It is designed in such a way as to provide maximum possible contact area with the two metal films. The structure is housed in a clear plastic or resin case, to provide free access to external light. 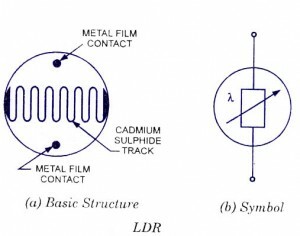 As explained above, the main component for the construction of LDR is cadmium sulphide (CdS), which is used as the photoconductor and contains no or very few electrons when not illuminated. In the absence of light it is designed to have a high resistance inthe range of megaohms. As soon as light falls on the sensor, the electrons are liberated and the conductivity of the material increases. When the light intensity exceeds a certain frequency, the photons absorbed by the semiconductor give band electrons the energy required to jump into the conduction band. This causes the free electrons or holes to conduct electricity and thus dropping the resistance dramatically (< 1 Kiloohm). The value of ‘a’ depends on the CdS used and on the manufacturing process. Values usually range betwee 0.7 and 0.9. LDR’s are cheap and are readily available in many sizes and shapes. Practical LDRs are available in a variety of sizes and package styles, the most popular size having a face diameter of roughly 10 mm. They need very small power and voltage for its operation. Highly inaccurate with a response time of about tens or hundreds of milliseconds.